“One of the wildlife wonders of the world” is how Sir David Attenborough once described the Bass Rock, and if you take the short boat trip out from North Berwick you’ll see why. This volcanic lump of rock that sits just off the southern coast of the mouth of the Firth of Forth has the world’s largest colony of Northern Gannets. The latest count estimates that there are 150,000 of these birds that make ‘The Bass’ their home during the summer. During June, July and August the numbers are swollen with the arrival of a new batch of chicks, and September sees the birds start to leave for the Bay of Biscay and West Africa. By the end of October most of them have gone, and then start to return again at the end of January. This entry was posted in East Lothian and tagged Boat Trips, Coastline, Conservation, Wildlife on 13th December 2018 by Malcolm. A half-hour train journey from Waverley along the East Lothian coast will bring you to the smashing little seaside town of North Berwick. The first time I came here I immediately fell in love with it. Little did I know at the time that it was one of the most expensive seaside towns to live in Scotland. It doesn’t have an outward appearance of wealth or anything like that, in fact it’s quite an unassuming sort of place in many ways. It doesn’t have much in the way of seaside attractions in the conventional sense, but more in the way of natural attractions. A conical volcanic hill known as North Berwick Law overlooks the town, its beaches and small harbour, but its location overlooking a handful of small islands in the Firth of Forth is what makes it a bit special. This entry was posted in East Lothian and tagged Beaches, Boat Trips, Children's Activities, Coastline, Conservation, Viewpoint, Walks, Wildlife on 12th December 2018 by Malcolm. I have to confess that I wasn’t sure how much I wanted to see Queen Elizabeth’s former private yacht, but when it was confirmed that the admission fee went towards the upkeep of the boat rather than into the pockets of the Royal family, I decided to travel out to the Ocean Terminal at Leith to take a look at this luxurious floating palace. Several buses run out to the Ocean Terminal, but you have to negotiate the shopping mall and its escalators to reach the 2nd floor and the entrance to the attraction, but from hereon in it’s plain sailing, so to speak. I suggest that you allow a couple of hours at least – more if you intend stopping for tea and cake in the Royal Deck Tea Room. It’s a self-guided tour with the aid of an audio guide which you pick up at the visitor centre before making your way to The Bridge. This is all very convenient for boarding the ship, but no so convenient if, like me, you would like to take photographs of the vessel itself. This entry was posted in Leith and tagged Maritime, Royal on 11th December 2018 by Malcolm. Opposite the Balmoral Hotel and next to the National Archives of Scotland, is West Register Street where there are a couple of watering holes worth seeking out. The Café Royal Circle Bar is well-known and wouldn’t look out of place on the Champs Elysées. Its famous Oyster Bar Restaurant attracts a clientele that prefers to indulge on oysters and a bottle of Dom Perignon rather than a pint of Belhaven and a packet of nuts. Mind you, there’s nothing to stop anyone having oysters and champagne in the Circle Bar if they prefer. It’s worth coming into this wonderful Victorian bar just to take a look at the décor alone. Apart from the magnificent bar, which is more elliptical than circular, there are some incredible Royal Doulton tiled murals of famous inventors and even some stained-glass windows that wouldn’t look out of place in St. Giles Cathedral were it not for the fact they represent outdoor pursuits rather than religious themes. As you might have guessed, all this comes at a cost. It’s certainly not the cheapest bar in town but it has to be said that the range of cask beers is excellent as is the service, even when it’s busy, which it very often is. If you can come here at a quieter time it will be easier to appreciate this fabulous building, but even though it does have something special about it, I feel more at home in the Guildford Arms next door. This entry was posted in Edinburgh and tagged Food and Drink on 7th December 2018 by Malcolm. The high esteem in which Sir Walter Scott is held by the Scottish people is shown by this huge monument to him in East Princes St Gardens. He is remembered mainly for his historical novels, but was also a prominent member of the Edinburgh establishment. 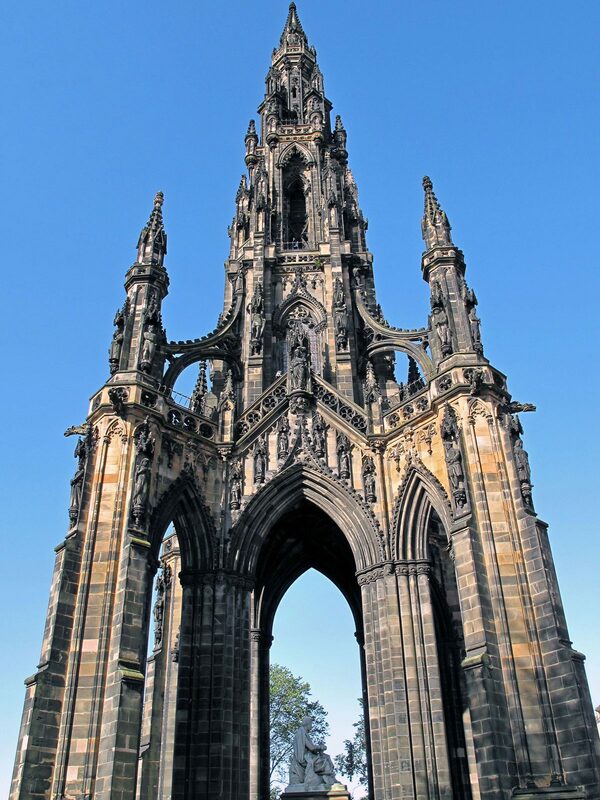 Born in Edinburgh in 1771, his poems and books brought him worldwide acclaim during his lifetime and when he died in 1832 it wasn’t long before enough money was collected to build this 200ft Gothic tower. Claimed to be the largest monument to a writer anywhere in the world, the foundation stone was laid in 1840 and completed by 1844. It was built of Binny Sandstone from Linlithgowshire (West Lothian today), but unfortunately Old Reekie has done its worst over the years and by the 1990s the stone was in need of some urgent attention. After close examination, it was felt that cleaning would do more harm than good and so it was decided to just carry out essential repairs with stone from the original quarry. The differences can clearly be seen. The space rocket-like monument is richly decorated with characters from his novels, and underneath the canopy is a statue of the man himself with his dog Maida. This entry was posted in Edinburgh and tagged Architecture, Statue Monument Memorial, Viewpoint on 7th December 2018 by Malcolm. Of all the history and tales about Greyfriars, there’s probably one that captures the public imagination more than any other – that of Greyfriars Bobby. During the 1850s, a man by the name of John Gray, walked the streets of Edinburgh as a night watchman for the local police, and with him, went his trusty Skye Terrier Bobby. They trudged the cobbled streets together but in 1858 John died and was buried in Greyfriars Kirkyard. The story goes that Bobby refused to leave his master’s graveside, no matter what the weather. Several times the gardener of the Kirkyard tried to move Bobby on, but he always returned, and in the end the gardener relented and made up a shelter next to his master’s grave. Bobby became a bit of a celebrity and was well looked after, but he never left the graveside. For 14 years he kept vigil until he himself died in 1872 aged 16. In 1981 an unconsecrated grave was made for Bobby near to where John Gray is buried. It has become a shrine for the thousands of visitors who leave flowers, toys and twigs to keep him company. If you would like to know what he looked like there’s a nice little statue of him on top of a drinking fountain near to the Greyfriars Bobby pub – and if you want to really engross yourself in the story there’s a Walt Disney film based on a children’s book by Eleanor Atkinson. This entry was posted in Edinburgh and tagged Folklore, Graveyard on 6th December 2018 by Malcolm. In 1638 the National Covenant, one of the most significant documents in Scottish history, was signed in Greyfriars Kirk. This document was the Scottish Presbyterian’s answer to Charles I’s religious policy which had been causing a lot of anger. Copies of the Covenant were distributed throughout Scotland and the Covenanters became the catalyst for the Bishop’s Wars of 1639 and 1640. This ultimately led to the English Civil War in 1642 and the execution of the King in 1649. After the restoration of the monarchy with Charles II, the Covenanters found themselves on the back foot and after the Battle of Bothwell Brig in 1679 over a thousand of them found themselves in a prison in Greyfriars Kirkyard. Although some of them switched allegiance and others escaped, there were many who died or were executed here. The area where the prison stood is still here and there’s a Martyr’s Memorial in the bottom right hand corner of the Kirkyard. This entry was posted in Edinburgh and tagged Graveyard on 5th December 2018 by Malcolm.